SM Cinema pulled off some MMFF 2016 entries to prioritize Vice Ganda, Vic Sotto’s films? 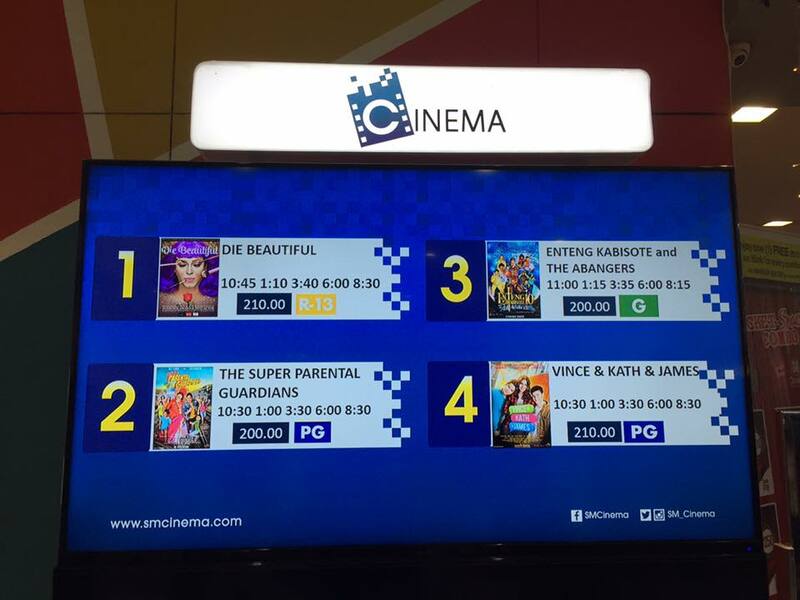 MANILA, Philippines - Several netizens have expressed their disappointment over some branches of SM Cinema for failing to show several official entries to the Metro Manila Film Festival (MMFF) 2016 in order to make way for Vice Ganda’s The Super Parental Guardians and Vic Sotto’s Enteng Kabisote 10 and the Abangers. Through Facebook and Twitter posts, several netizens revealed that various branches of SM Cinema only accommodated a few MMFF entries to allegedly prioritize the two movies, which failed to qualify to this year’s movie festival. In a Facebook post, netizen Vanessa Ebron claimed that SM Cinema in Calamba screened MMFF entries like Die Beautiful, Seklusyon, Ang Babae sa Septic Tank and Vince and Kath and James as well as non-MMFF entry The Super Parental Guardians on Christmas day. But on December 26, SM Cinema in Calamba scraped off Seklusyon and Ang Babae sa Septic Tank and replaced it with Enteng Kabisote 10 and the Abangers. Ebron later learned from the cashier that it was a directive from the head office of SM Cinema. “Tinanong ko ang cashier kung bakit ganun, unfair dahil hindi naman MMFF entries ang The Super Parental Guardians at Enteng Kabisote. Wala daw silang magagawa dahil yun daw ang directive ng head office ng SM Cinema,” Ebron write in her post. A certain Owa Seguin lamented how SM Cinema failed to give opportunity to other MMFF entries even if there’s a demand. “I hope that SM Cinema Baguio will prioritize promoting art appreciation with the quality films of MMFF than the usual selfish lust for profit,” wrote netizen Aloysius Calma Mapalo. Meanwhile, several netizens praised SM Cinema in Fairview, Valenzuela, North Edsa and Trinoma for prioritizing MMFF entries. On Day 3 of the festival, the bottom four films “Kabisera,” “Oro,” “Saving Sally” and “Sunday Beauty Queen” took to their respective Facebook pages to ask moviegoers to support their films. MMFF spokesperson Noel Ferrer said that these movies must fill up at least 10% to 20% of the cinemas where they are being screened so they can stay in the bigger theaters. In a Facebook post of National Film Council chairperson Liza Dino-Esguerra, she clarified that it is not mandatory for theaters in the provinces to play only MMFF films. "Metro Manila lang ang covered ng batas so they can choose to play other Filipino films in the provinces."